When you’re tasked with switching from QuarkXPress to Adobe InDesign, or if you’re completely new to Adobe’s Creative Suite 3 product line, there are plenty of Web sites that offer tips, tricks and tutorials. For many of us, though, picking up a good-old-fashioned book is the way to go. With the right book, not only can you “take it with you,” but you have a quick reference that doesn’t require a Web connection to give you some answers. 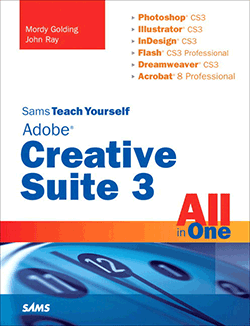 One book that I recently discovered, Sams’ Teach Yourself Adobe Creative Suite 3 All in One, by Mordy Golding and John Ray, is the perfect book for switchers and other newcomers to CS3. Teach Yourself CS3 has nearly 700 pages of valuable information about the entire suite, including Photoshop, Illustrator, InDesign, Flash, Dreamweaver, Bridge and of course, Acrobat Professional. Having one book to cover all seven applications is quite handy, and makes it much easier to see how all the apps tie together. The authors make few assumptions about their readers: they start off with an overview of which applications you should use for which task, how to develop a workflow and how the applications integrate together. For anyone familiar with the Creative Suite, this section can be skipped, but it’s great for users unfamiliar with the Adobe apps. Next up are chapters cover each one of the Creative Suite applications. Each chapter starts off with an introduction to the application, brief how-tos on the major tools and the concept behind why they exist, then goes more into depth on the power tools. Once you’ve been taken through the basics of all the applications, Teach Yourself CS3 leads your through five projects including creating a brochure, a Web banner and a Web page. In each of the five projects, you’re shown how the various applications in CS3 come together to complete a project. Upon completion of the projects, you’re given a brief overview of outputting your files for printing by a commercial printer. This section isn’t nearly as deep as it could be, but it covers the basics. Littered throughout the book are brief, context-sensitive tips that are surrounded by a keyline so they stand out more. Since it is covering seven applications, Teach Yourself CS3 simply can’t cover every facet of each application, but it does give an excellent summation of their important aspects. Acrobat, for example, is the least understood of the Creative Suite applications, but the book offers solid coverage of many of its features, including digital signatures, encryption, form data, security, and manipulating existing PDF files. If you’re already familiar with CS3’s print-based applications and are looking for more in-depth learning on Dreamweaver, you may want to check out a book specific to it, such as Adobe Dreamweaver CS3 Unleashed, which is over 1,000 pages of Web design goodness that will make you a master in no time.